Your old friend Rachel has reached out to you – you’re to meet at the Red Cape Bar for a happy reunion. Everything seems great; you catch up on the latest, you admire her new tattoo…wait – is it glowing? The bar’s television catches Rachel’s attention suddenly as there are reports of missing people around the city. Also, there’s a health warning regarding new tattoos everyone is getting with exotic ink. The reporter warns those who have the new tattoos to seek medical attention immediately. Suddenly, there’s an explosion, a man yells, and she’s disappeared with a shriek in a cloud of smoke. Rachel’s been kidnapped and taken down the alley by some thug! Welcome to the Anderson Accounts, Chapter 1. You’re Chris Anderson, and on the case. Science and reason seem to come up short in this magical mystery. The atmosphere is set in a city by the bay. Rain softly pelts the buildings outside. Neon lights glow softly in the darkness. Old warehouses are faded in the soft light of the moon. It’s a really wonderful setting – and going from old building to old building really adds to the game. You’re looking for Rachel in her apartment, but the old dilapidated elevator is broken and there are papers littered everywhere. You can tell the place isn’t kept up and it’s not located in the nicest of areas. But that makes it interesting as well as there’s so much to explore in the clutter. The background music is excellent - adventuresome and thrilling - but not over the top. You can hear distant city noises as well, which makes you feel like you’re really there. The voiceovers are great, and graphics are well done. Those dark colors of the city add to the suspense of the game. All the games are great. The mini games are so tied into the game that you feel like you’re almost on an obstacle course. Figure one out and you can move to the next level. They’re themed and fun to play – not too hard. I found myself trying many of them out instead of hitting the skip button. If you’re fast (and you will be, they’re not too hard), you get achievements. 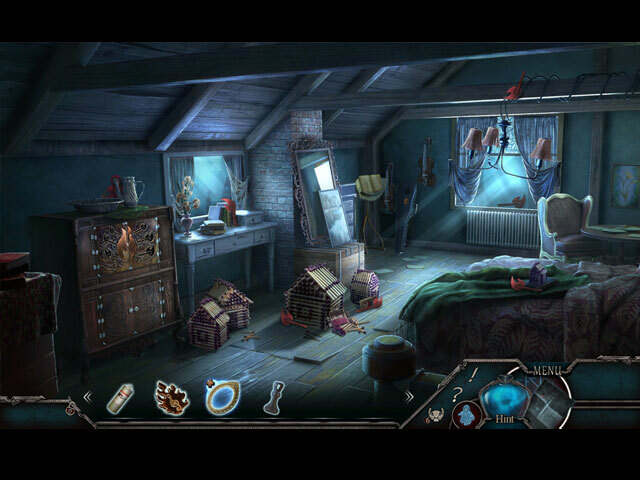 The hidden object puzzles are extremely well done and very creative. One HOP adds neon to objects, which is a nice tie-in to the city theme. 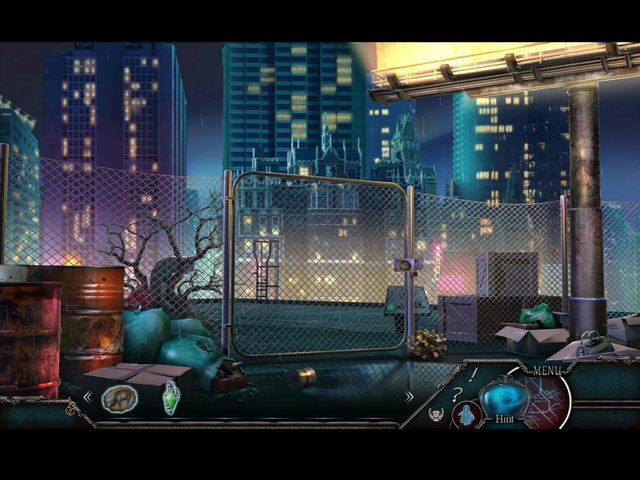 Objects also morph, and you have to collect a total of 16 throughout the game. I also like the hint button – it sends out a scorched fireball that winds around the scene and points you in the right direction. Along the way, you begin to think maybe you don’t know Rachel as well as you thought. You discover she likes to wear a red cape (you locate it in your search). You also have to find a hidden Red Riding Hood in each location, to find a total of 31. Hmmmm… I wonder what direction this is going? Additionally, there does happen to be a wolf painting in her apartment. 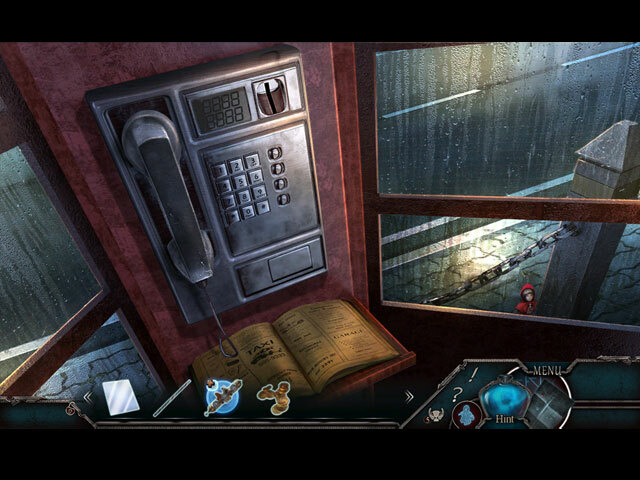 Clue upon clue unravels a well-known story in the midst of this mystery. This was a wonderful game to play. All the mysterious elements work really well with the story. The pace is perfect, and along with the surroundings, you really feel like you’re in the midst of a city hunting for your friend. All the mini games are great to play – and so well done with the theme. If you want something a little different, science fiction mixed with an old fairytale, then I would recommend checking out Anderson Accounts, Chapter One.